You’ve heard it a million times: You need to exercise! So why don’t you? If age, injury, disability, illness, or weight problems have limited your mobility, it’s even more important to exercise. Exercises can ease depression, relieve stress and anxiety and enhance self-esteem. Regardless if you used to exercise or not, you’ll still reap the physical, mental and emotional rewards. As you move against the water, the water naturally massages your body, making you feel more relaxed and relieves some of the tension in your body. The water provides resistance and provides a better workout that on land. The water’s buoyancy makes you feel lighter so there’s less pressure on your joints. Buoyancy will also allow you to move in water without dependency on equipment or device like wheelchair, cane or prosthesis. 1. I’m afraid I’ll injure myself more if I exercise. Aquatic exercise is a low-impact activity. Buoyancy counteracts gravity decreasing the weight placed on your joints, bones, muscles and spine. When fully immersed in water, your body has to only support 10% of its weight. In waist-depth water, buoyancy supports about 50% of your body weight. Being in the water allows you to safely exercise without fear of falling and alleviates joint pains and increases circulation improving your range of motions. 2. I don’t know how to swim. Aquatic exercises are designed for anyone, including non-swimmers. 3. I have a hard time getting my swimsuit on and off. 4. I’m self-conscious about my body, my injury or disability. You can exercise early in the morning or other times when the pool is less crowded. Go to a therapy pool where the other users have similar limitations and are focused on their own rehabilitation and wellness. 5. I can’t climb in and out of the pool. 6. 30 minutes in the pool is a whole day event for me. This is the case for many. The effort of transportation, changing, showering and returning home seems daunting. Think of it as an outing, a change in your routine, a time to socialize, get exercise, and ease the pain in your body. Allow for the time in your day and enjoy getting out. 7. I don’t have the energy to exercise. It may seem counterintuitive but regular exercise can actually build up your energy level and reduce fatigue. People with health challenges often feel trapped in a cycle of pain, depression, and stress which leads to the belief that exercise and fitness is impossible for them. Aquatic therapy can break this cycle because of the unique properties of water. 8. I’m a sinker – if I lose balance and fall I will surely drown. You’d be amazed how many times I’ve heard this. Ironically, you are safer in the water than anywhere else if you are concerned about balance. The lifeguard and your instructor or aquatic therapist are trained and happy to help if you feel uneasy in the water. 9. Aquatic exercises can’t improve my activities of daily living on land. 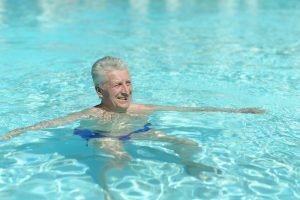 Aquatic exercises will increase your muscle strength and improve mobility and flexibility of joints which will enable you to have the strength, balance and energy for activities of daily living. 10. I am incontinent and afraid I will have an accident in the pool. While this is a large concern for many, believe it or not, there are ways to safely be in the pool if you are incontinent. Many people have portable catheters that they discretely hide under their swimsuit and there are many different styles of adult swim diapers designed for persons with urinary and bowel incontinence. If you have other reasons NOT to try aquatic exercises, please let us know. We’ll try to convince you to do otherwise. We are not affiliated with either companies. © 2019 Nurturing Water Therapies, LLC. All rights reserved.